Country Living…or…HELP GET ME OUT OF HERE!!!! Yesterday we had quite the adventure. For the most part we love living a little on the edge of civilization. We like the night sky and the deer. We enjoy hearing birds. We, however, do NOT enjoy this part of it. 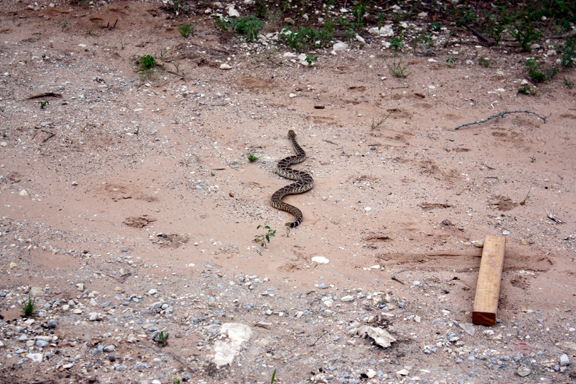 Yes, that is a rattlesnake. At least 3 feet long. Just hanging out in our driveway. A lovely surprise for my husband to find in the morning. 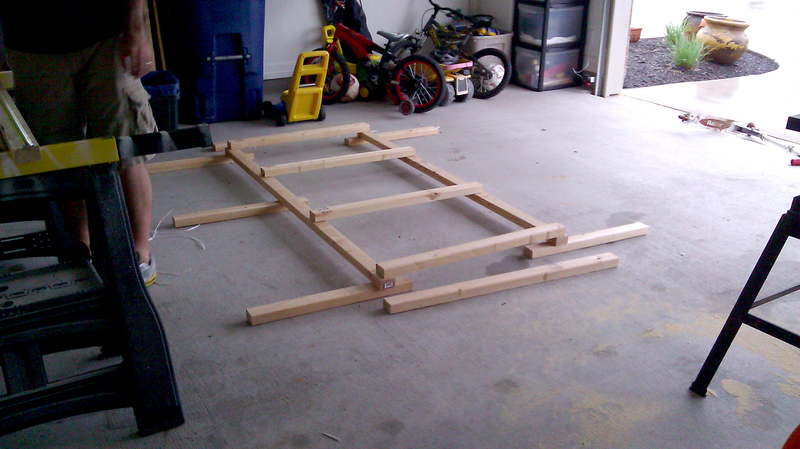 For perspective, that board is about the length of my arm. Here is a closeup of our slithery frenemy. Here is my brave son Austin protecting Logan. Austin was very worried and wanted to go inside. Logan was very curious and wanted to stay outside. 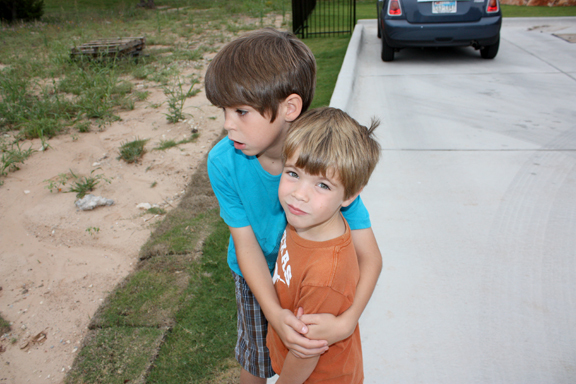 So Austin decided to stay outside and “protect” Logan. Very sweet! …with a Mighty Push Broom. Please keep in mind that we have a Machete, and Shovel, a Chain Saw and a whole slew of other deadly and dangerous weapons in the garage. 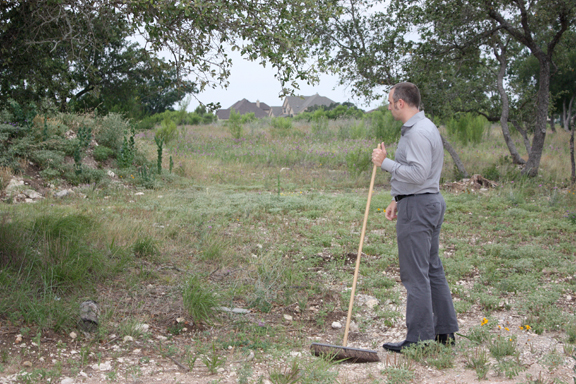 But no, Dan’s weapon of choice was the Ominous Push Broom. With bristles that will cut like…well bristles. And…and…and…well and nothing. There is nothing deadly about this weapon. So the snake lives another day. I will be totally honest, my first reaction was lets sell this place, I am out of here! No way did I sign up for Evil Nature. Deer, Fox, Turkey, that is all fine. 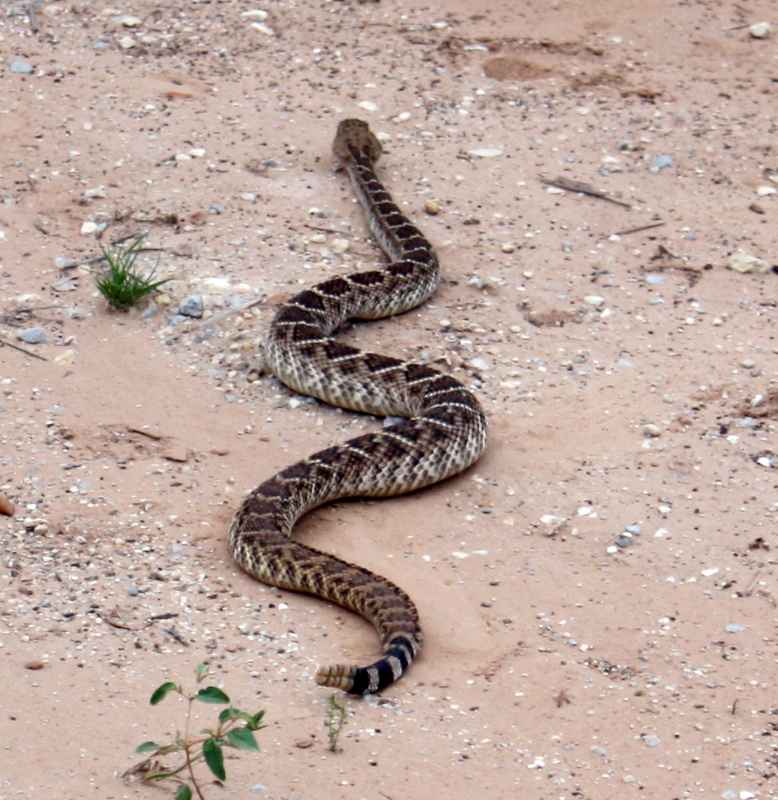 But a GINOURMOUS rattlesnake, which may or may not be Diamond Backed. Um no, not in the plan. However, today I feel a little more excepting of our new neighbor. Especially since we cut short all the shrubs, killed all the weeds and lined the property with snake repellent. This is one neighbor I do not want to see again. I dedicate this post to my poor husband. He too suffers most terribly from the Man Cold. Not only that, but also the dreaded Man Allergies. If your man also suffers from this terrible illness, then please, share this important message with those you know. Growing up I constantly heard the phrase “I sure hope you kids turn out!” You may also have heard that term during your childhood. If you are reading this and related to me, I know you did!!! Well today it was officially made official. I Tannie M. Smith have turned out! 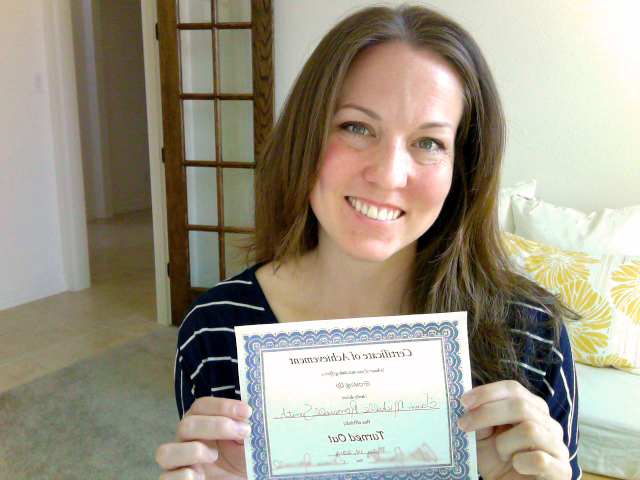 This morning my mom presented me with this certificate, signed by BOTH parents. So there is a consensus. ;-) Phew! Don’t I have the best parents ever!?!? 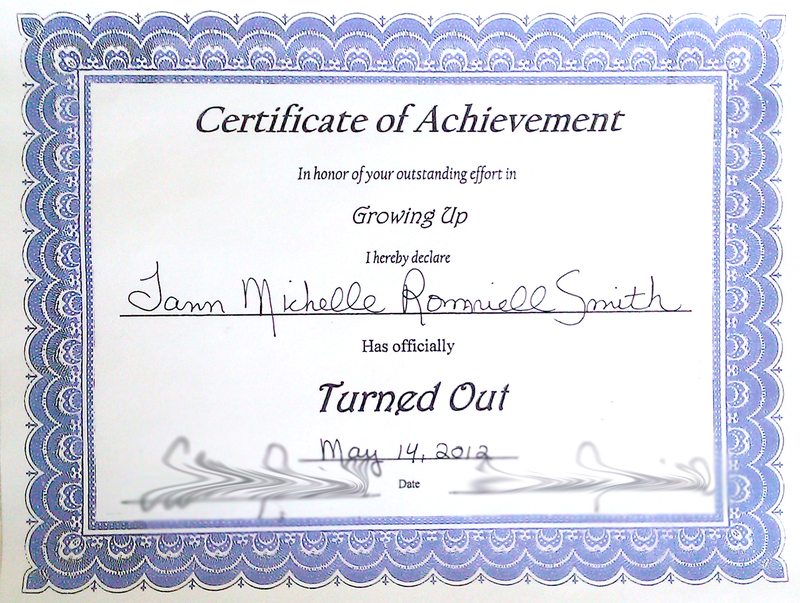 I will admit, it feels really good to have official recognition in “turning out.” It really takes a lot of pressure off!! Now the future is clear and I no longer have to wonder if I “turned out” the way I was supposed to. Thanks Mom and Dad, you are definitely the best parents ever!! Well No More!!!! Here is another handy cleaning tip for you guys -Straight from The Smithocracy. 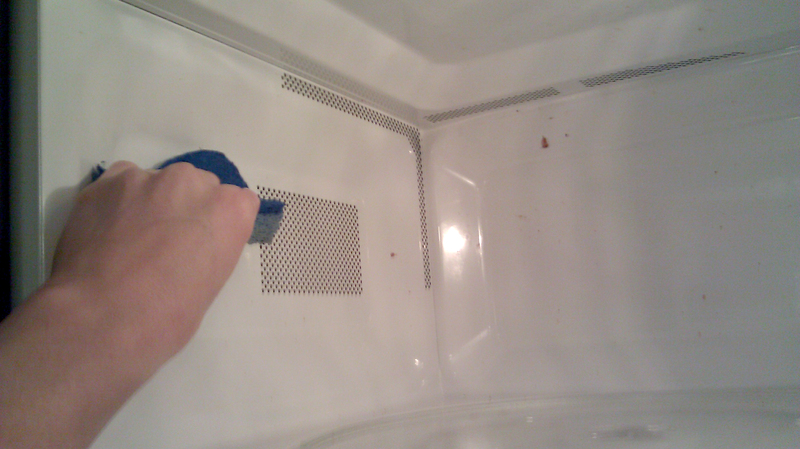 One of the worst chores ever is cleaning the microwave. It is so annoying that most people put it off until it is covered in more food then you are heating up. Well this is a simple way to get that gross grime off. I have used this method for over 8 years. So it is tried and true. Fill a bowl with water and microwave for 20 minutes. Wipe out with sponge. Now for the long and more visual explanation. First you need a dirty microwave. Now I know that the microwave does not seem THAT dirty. However it took me forever to get my microwave this dirty and I didn’t want to wait any longer. 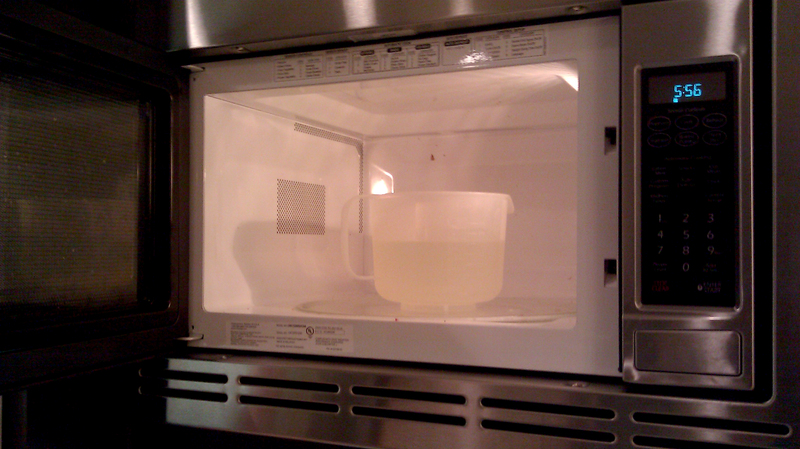 This method works so great, that my microwave is always clean. So I had to tell everyone to start on purpose letting their food explode. So this is as good as it gets folks. 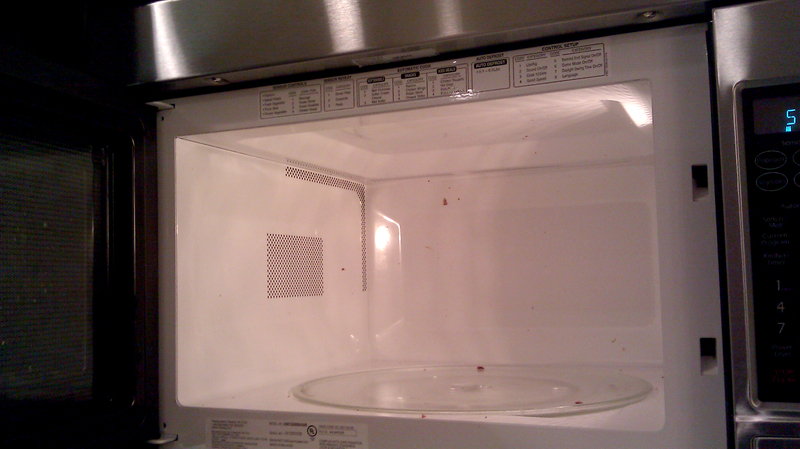 But lets pretend that this is more like College Microwave dirty. You know. Red-hot-pocket-sauce-crusted-allover dirty. Maybe yours is not so clean right now and you are feeling a little guilty. So that brings me to the next thing you need. A microwavable bowl filled with water and some lemon juice. 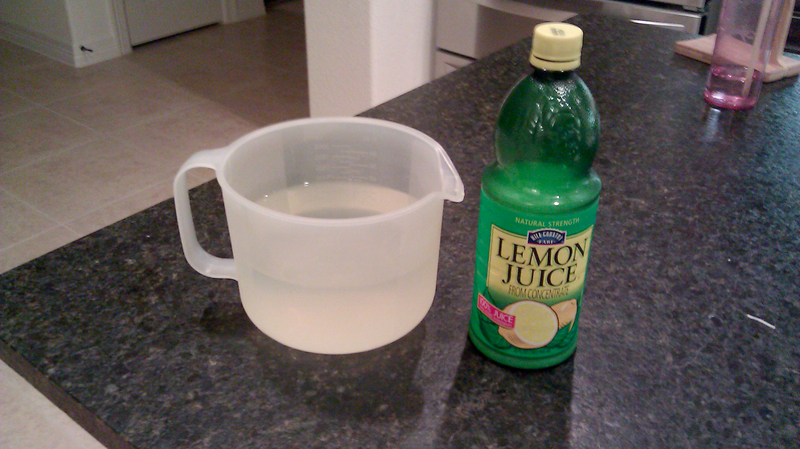 Although you don’t really even need the lemon juice. It just makes it smell nice. Fill up your bowl about half way. I think I have about 2 quarts there. And then I just pour some lemon juice in. Maybe like 2 or 3 tablespoons. Next stick the bowl in the microwave. And microwave on high for 20 minutes. Meanwhile you can load the dishwasher, or wipe the counters, or read a book. That is really up to you. 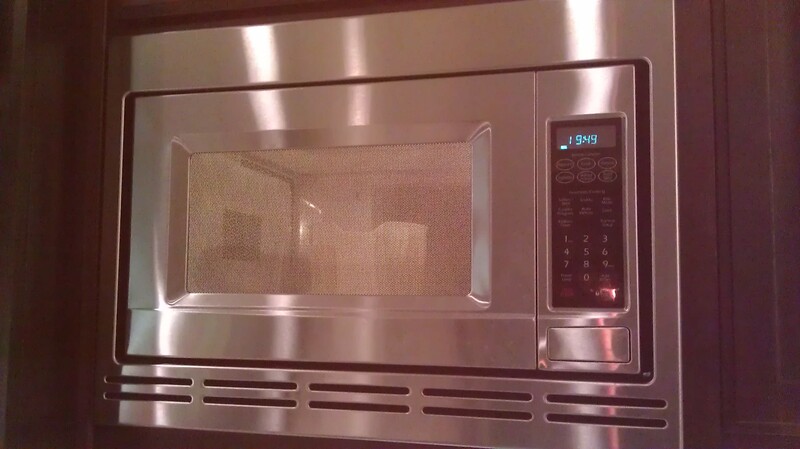 Once the 20 minutes is up you remove the bowl and just wipe out the microwave with a sponge. It really is that easy. You just wipe it off. So easy. Now you have no excuse for putting it off any longer. 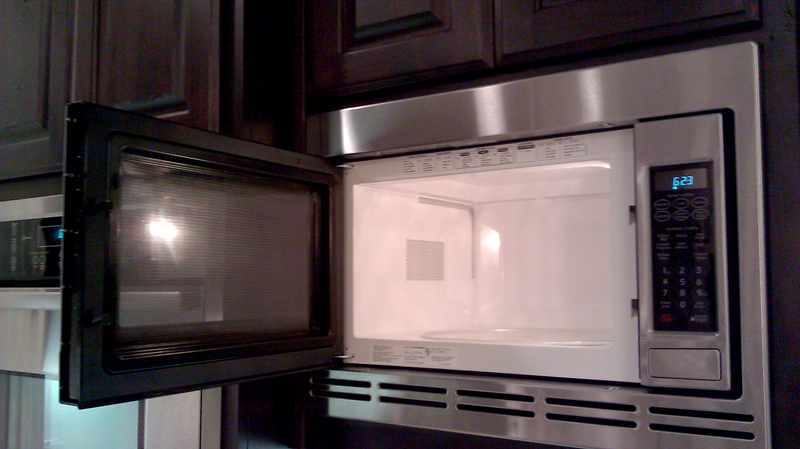 You can have a clean and lemony microwave too! 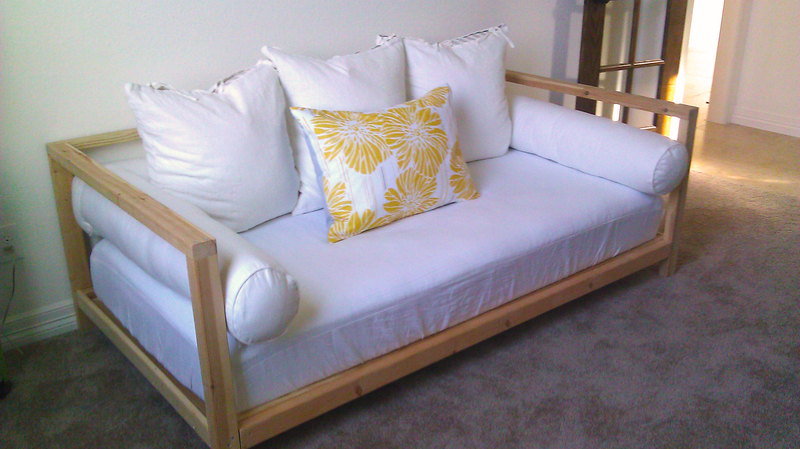 It’s here, the long awaited, much talked about (let’s see if you even remember from this post about it) Daybed! It turned out so great…but alas, it is still not Quiiiiiiiiiite finished. 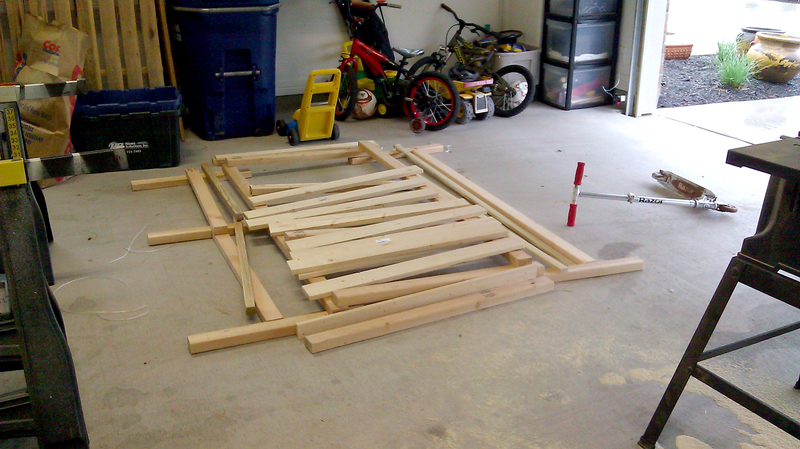 It still needs some paint on the ol’ timber, but who knows when that will actually get done. So here in all it’s (mostly) complete glory are the details. Or the Deets as you young folk say. First we needed a plan. 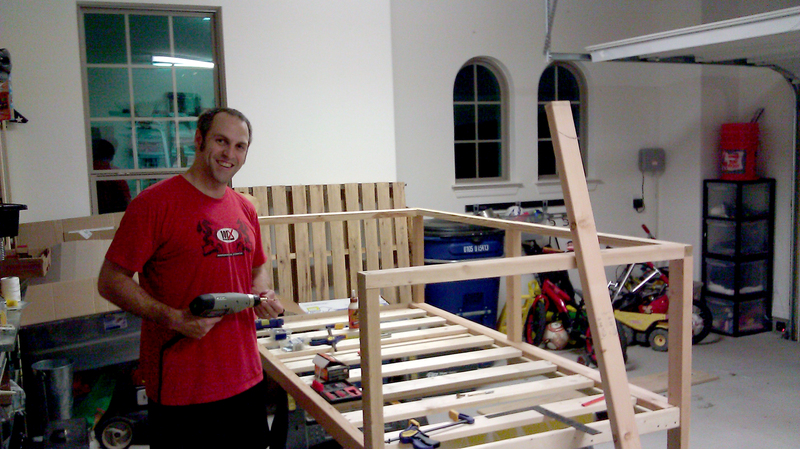 And the plan was a daybed. 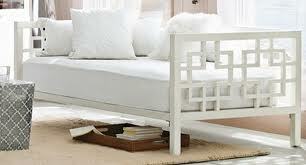 I really wanted this daybed from West Elm. However, we at The Smithocracy are cheap cheap cheap. So if we don’t want to spend it, we build it! We scoured the internet for some plans and we found this great little site. Rayan Turner is the person behind this site. 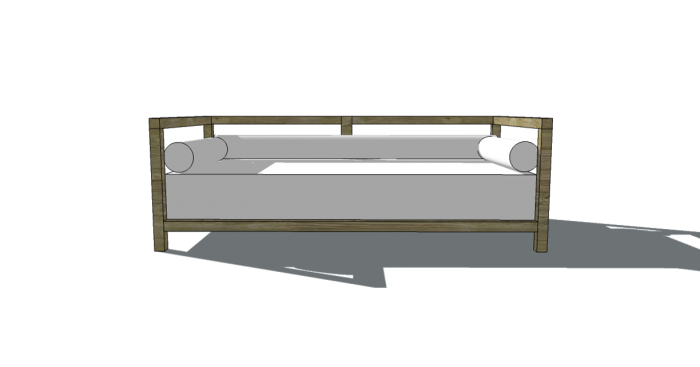 It has so many great ideas for the DIYer and this is where we found some plans for the perfect daybed. To see what we found go here. But here is the idea. We now had a plan, now we just needed action. Dan studied the shopping list and gathered the necessary materials. Careful careful measuring. Then time to grab the crew and do some cutting. 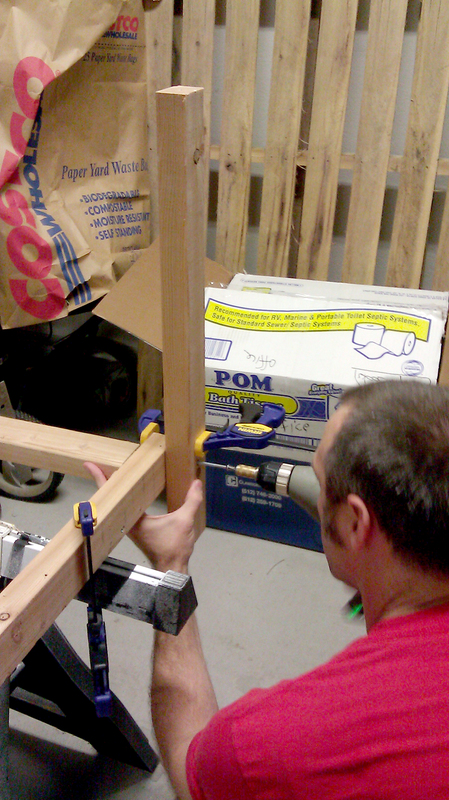 Once he had all the cuts needed, we ended up with this. Yep, a pile of wood. 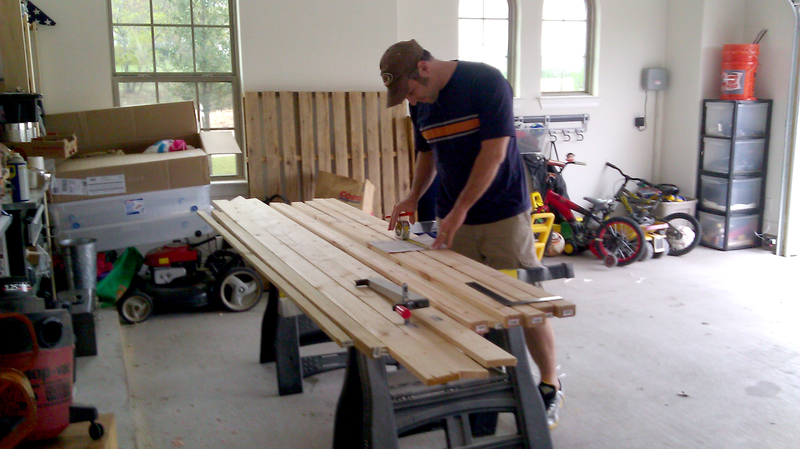 BUT a pile of wood that is cut to correct proportions. If only it was actually that easy. This project was only supposed to take a couple hours, maybe a day at tops. We took about three days on it. For two reasons. 2. Now this was the main trouble. 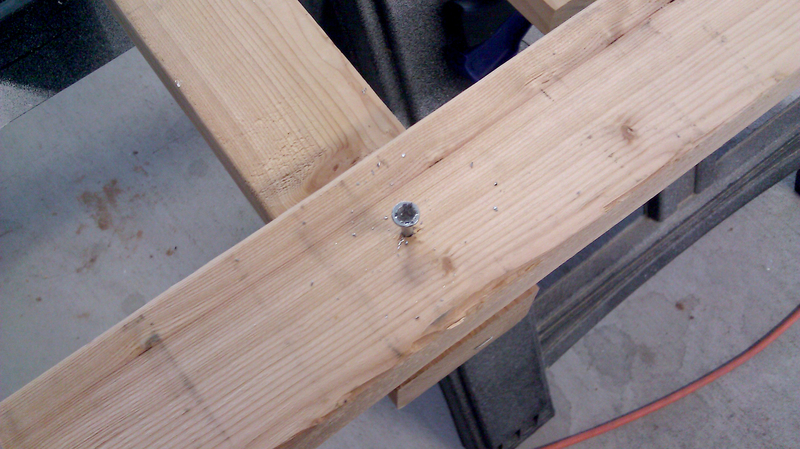 Every single screw stripped out on us. EVERY ONE. And there are A LOT of screws in this thing. So this caused a lot of headache and arm ache and possibly some glaring. However Dan powered through it and we ended up with this masterpiece. 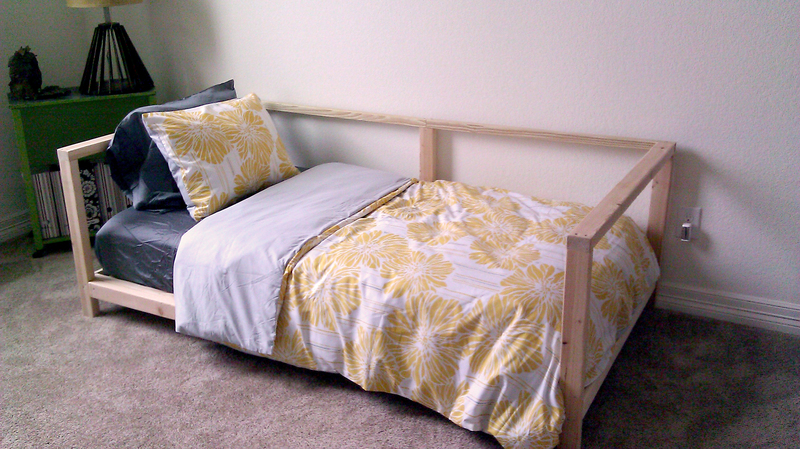 Here it is debuting as a guest bed. 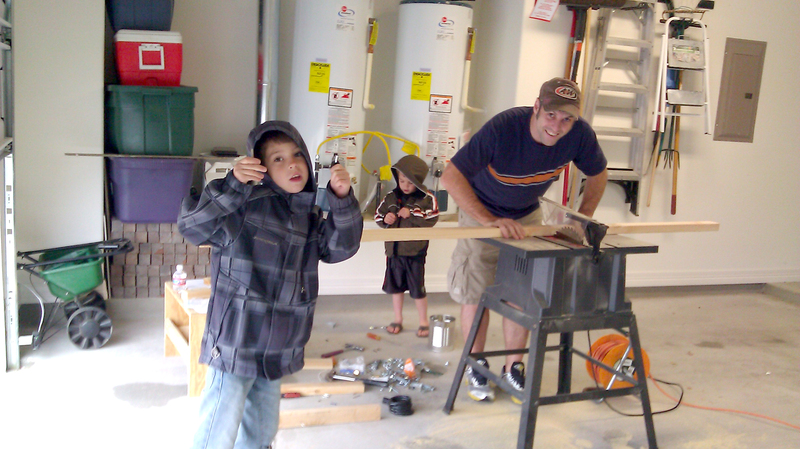 We plan to paint the wood a satin grey color. We are also going to add another set of cross bars on the side to help hold the bolsters up better. They tend to fall through…all the time. The Smithocracy verdict is that we LOVE it! It is so handy in my office. We use it to watch very important things like The Legend Of Korra or Madd Chadd videos. It has also come in super handy for some fun guests. For those of you that are more detailed oriented. The Mattress is from a local place called Austin Consignment. No the Mattress was NOT consignment. ew. And the yellow pillow and bedding is from Target. 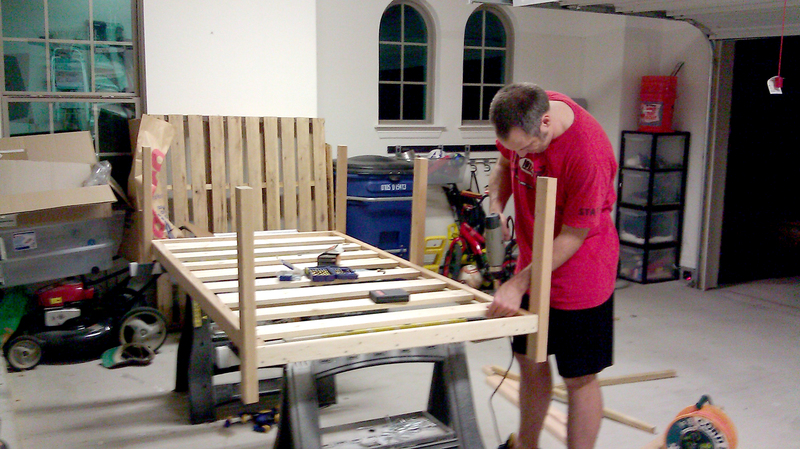 I think the total for this project, including buying a mattress was $300. Not too bad I think. So thank you to The Design Confidential. 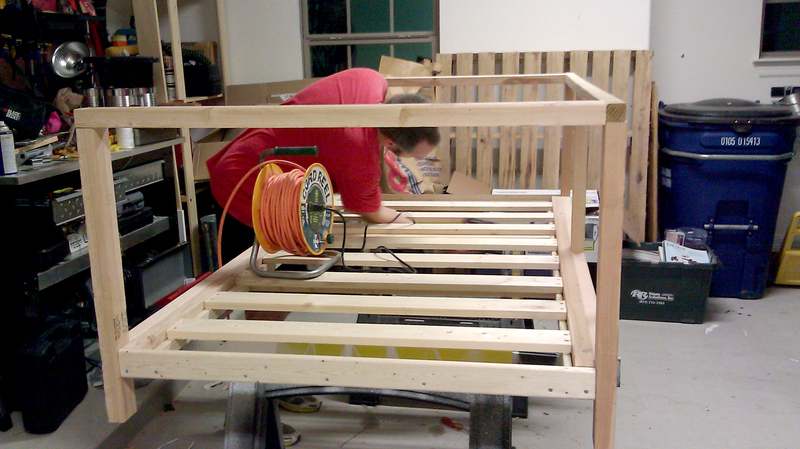 Without your plans, we would still be daybed-less. And that would be so sad.